Gen Xtinct: Autographs for your book! We realize the holidays are almost upon us, and we assume anyone who reads this blog or our Facebook page knows that our book, "Whatever Happened to Pudding Pops? 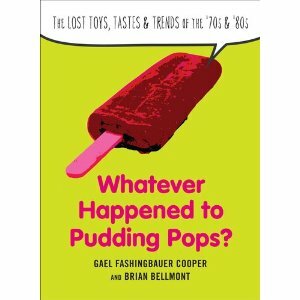 The Lost Toys, Tastes and Trends of the 70s and 80s" was published in June. May we suggest they make great, inexpensive and fun gifts, especially for anyone who shared the 70s and 80s with you? Siblings, cousins, old neighbors, high school friends, anyone who popped a collar or went to a prom or snuck into a Freddy Krueger movie with you. And we're making a special offer: We can't travel around the entire world to sign everyone's book, but we CAN sign labels that you can then attach inside your book. If you'd like a label for your book, or for a gift or gifts, just send a self addressed stamped regular size envelope. Include a note saying what, if any, personalization you'd like ("To Jamie Sommers, we think you'll especially like the Six Million Dollar Man doll chapter") or just tell us who to address it to and we'll fill in the blanks. Your label will be autographed by both Brian and Gael and mailed out to you the day after we receive your SASE. I loved Jell-O Gelatin Pops and Pudding Pops and was disappointed when they were discontinued, but I've found that filling plastic ice-pop molds with gelatin or pudding provides you with almost exactly the same experience (at least in taste if not necessarily appearance). I think the folks at Jell-O must have used some sort of special mixing or freezing process.